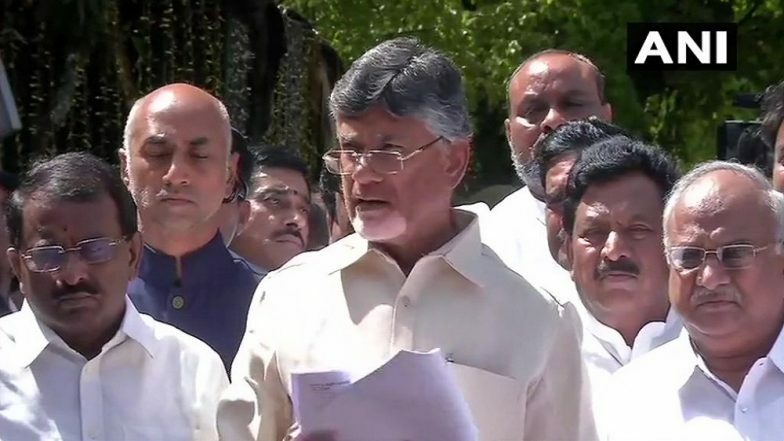 New Delhi, April 13: Two days after the assembly and Lok sabha polls in Andhra Pradesh, Chief Minister N Chandrababu reached the national capital to submit his complaint to the Election Commission. The TDP president demanded the polling body to return to ballot papers, apart from charging it of "working on the instructions" of Prime Minister Narendra Modi. Naidu's tirade against the EC comes in the backdrop of EVM glitches being reported at various polling booths of Andhra on Thursday. While the Commission conceded that 362 of the 45,000-odd electronic voting machines had malfunctioned, Naidu alleged that nearly 30 per cent of the total EVMs had developed technical snag. In his letter to the Commission, Naidu said his concerns over the reliability of EVMs were repeatedly brushed aside by the polling body in run-up to the elections. At least now, the Andhra CM demanded, the system of ballot papers should be brought back. “We demand the Election Commission of India for reverting to paper ballot system immediately to preserve the sanctity and protect the spirit of electoral process and democracy respectively,” Naidu said after meeting the EC officials. Raising questions on whether the polling body is acting impartially, Naidu alleged, "Government of India is interfering through EC. We have complained against EVMs earlier also. EC is an autonomous body but they are working at the instructions of Modi." Notably, all the 175 assembly seats and 25 parliamentary constituencies were contested in Andhra in phase 1 of the elections, held on April 11. Naidu has charged the EC of favouring his key rival, YSR Congress Party chief Jagan Mohan Reddy, alleging that administrative officers were transferred by the polling body on his behest. "Transfers of officers in AP is unjustified. By acting on the frivolous complaints of YSR Congress Party, the (government) machinery was paralysed," he said, further claiming that the EC had appointed an officer for poll duty who is a "co-accused" in a criminal case involving Reddy.